Find hotel near Steam The Escape Game Lim .. STEAM the Escape Game Limoges is the place you would want to be if you wish to experience what it is like to be an Escape room. Here, you can choose from the virtual room or the one with a real scenario. For the virtual room, you have to solve puzzles in order to escape. While in the live escape room, participants are locked up in a room and are then faced with certain challenges overcoming which they have to make it out of the room within defined time. From varied riddles, objects whose usage would have to be found out, codes to search for, padlocks to unlock and much more, the challenges are fun. At STEAM the Escape Game Limoges, you are sure to have a fun experience. How popular is Steam The Escape Game Limoges? People normally also visit Cathedrale Saint-etienne De Limoges while planning their trip to Steam The Escape Game Limoges. 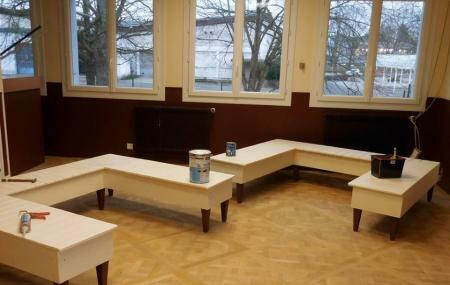 Super salle, accueil très charmant et énigmes très sympa. Seul petit problème, le lieu où il est situer. Fort recommandable pour passer une bonne heure et demi entre amis ou en famille.